When I first visited the Neely Mansion with my friend Inger Anne Hage it was a mere 71 years old – my age now. But now at 116 it looks considerably better than I. This improvement is the work of the many volunteers who have gathered around it for the restoration and maintenance of this national landmark. Aaron and Sarah Neely completed the ornate farmhouse east of Kent in 1894. Aaron was seven when he crossed the Oregon Trail with his parents David and Irene Neely in 1853. The family came directly to the future White/Green River valley and was thereby among its earliest settlers. One of the Neely Mansion volunteers, Karen Meador, introduced me to the historical photograph of the mansion and also took the “repeat” during a visit by Neely descendants. And this would be the proper place to name them. First the visitors in the “now” photo, left to right. Left to right, Ken Beckman, Aaron Beckman, Grant Beckman, Howard Elliot Neely, and Jane Neely Beckman. Howard is the 93-year-old grandson of the Aaron Neely who built it. Understanding the difficulty of “reading” the faces of the six figures posing in the “then” we will note two with reserved confidence. The young boy, third from the left, is – or seems to be -Howard Elliot Neely’s father Aaron Neely Jr., and the woman, far right, his mother Sarah Graham Neely, Aaron Senior’s wife. 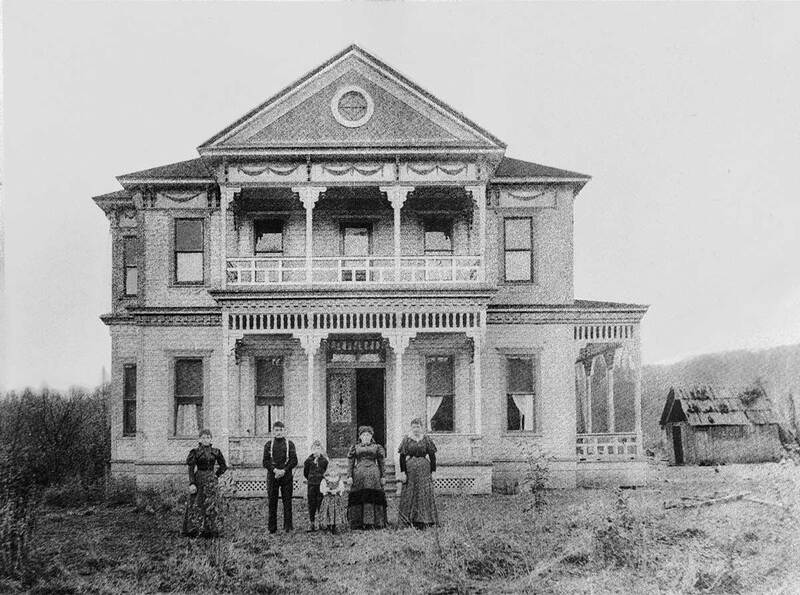 The photograph is almost as old as the house, for by 1900 the family missed the social excitements of town life and moved to nearby Auburn. According to Meador “Through the next several decades the mansion and its 200 fertile acres were leased variously to Swiss, Japanese and Filipino tenant farmers.” Sometime in the 1960’s it made a transition to disrepair. That is how we found it while on our way to the Black Diamond bakery. We peeked in a front window and found a mess. Now thanks to the Neely Mansion Association this classic Victorian is open and operating. Typically, I cannot find the negatives for that 60s trip to Black Diamond for a cinnamon roll when we also stumbled upon the Neely Mansion. This one example of the day's shoot was available because it was used in The Seattle Sun sometime in the mid-1970s. Susan Chadwick, then the editor, asked me if I had anything they could run for Halloween. I thought of - and found! 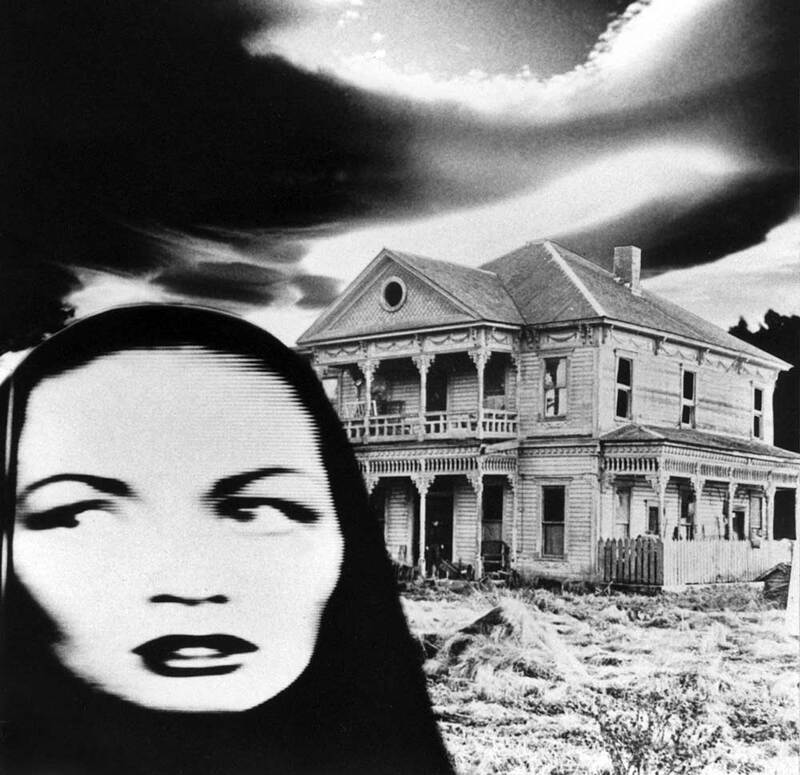 - the Black Diamond trip photos and made this pre-photoshop collage of my distant snap of the mansion with a foreground copied from a TV Horror film (I once knew the name of this actress - David and Bill will know!). I also lifted a storm cloud from a slide that Fred Bauer sent to me in the early 1970s. That cloud is over Inverness, California (at least that is where Fred was then living) and not over Auburn. It was yet another hoax embraced by a tabloid with progressive instincts and at home on Capitol Hill for quite a long run. Ah, I see you’ve found the farmhouse on whose porch I would eat my reconstituted bread, along with a salad of pebbles (let the reader understand). This is a beautiful set of images, Paul. I once went a-roaming in my Beetle Bug down around Ravensdale and Black Diamond, ended up in the Black Diamond cemetery musing over the pronunciation of the names of Welsh mining families. A grand day out. I would have loved to have stumbled upon this place then. I read your Now & Then article this morning in the Seattle Times and I am confused. It begins with When I first visited the Neely Mansion with a friend, it was a mere 71 years old – my age. But now at 116 . . . are you 116 years old? Thank you for noticing. I am indeed the oldest living Estonian historian living now in the U.S.. Of course at 116 I cannot get much loving attention from volunteers, hence I frankly don’t look so good. But I can still read and sometimes write. Paul, While vaguely familiar, I have no idea who this actress is. Were she from the silent era I could tell you yesterday. I’ll post the link to Facebook and put the question to my TV friends. Kathy, I assumed Paul was saying, “When I first visited the Neely Mansion with a friend, it was a mere 71 years old – my (current) age.” Based on his response to your question let’s conclude, Paul may be aged, but he hasn’t lost his sense of humor. I dont know who she is either. Responding to my FB question, David Johansson agrees with Bill, Lily Munster. Possibly. 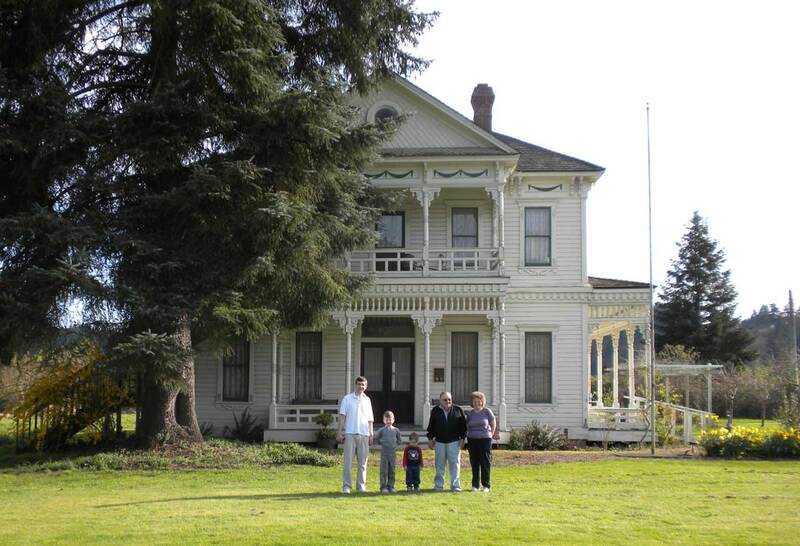 Thanks for posting the article and history of this wonderful house. I lived up on Lake Holms road and passed by it many times. It is good to see it restored. I enjoyed the haunted house the Auburn Drama club put on in there. Just started researching my family name; not sure if there’s a connection. Either way, what a beautiful home. It seems more than coincidental that my immediate family has been very involved with non-profit historic preservation and restoration. I look forward to visiting next time we’re in Seattle. I drive by the Neely Mansion and have thought it to be a beautiful home. I have wondered at the story behind Neely Mansion. I also have thought-why has no one taken down that giant evergreen tree on the East corner of the home? It is big enough to do damage and for me, it takes away from the mansion’s design. I would love to see landscaping included in the mansion’s next restoration. I had to take down a big Amercian Elm that was pushing the foundation of my home. But I did not want to. Perhaps this is far enough from the foundation that it is not upsetting it. But of course a hundred year wind storm from the wrong direction might. Perhaps we should all move into WW2 surplus pillboxes. When I was 2 years old my Dad and Grandpa Ace lived in this house when they moved to the U.S. My Uncle Pete’s farm was right next the Neely Mansion. I still remember when my grandpa would invite us over to the Mansion for dinner and we would stay the night. It was beautiful! I remember when my mom and I went up to the 2nd level to one of the rooms or attic to read some old dusted books. I still have the original books and cameras that my grandpa gave us when he occupied the home. We still have the pictures of when I was little and we took pictures in front of and inside the house. Alot has changed and I’m glad the house is still preserved!